Zork Industries Broadcasting Corporation presents: Awesomenauts, the Documentary. Let this retired explorer take you on a journey the likes of which you have never seen. 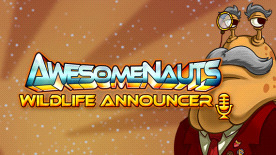 The Wildlife Announcer will turn every Awesomenauts match into a documentary in which the circle of life continues ever onwards. The Wildlife Announcer can be activated from the character select menu or the in-game menu. Activating this Announcer will replace the default announcements made during regular gameplay with a whole new set.